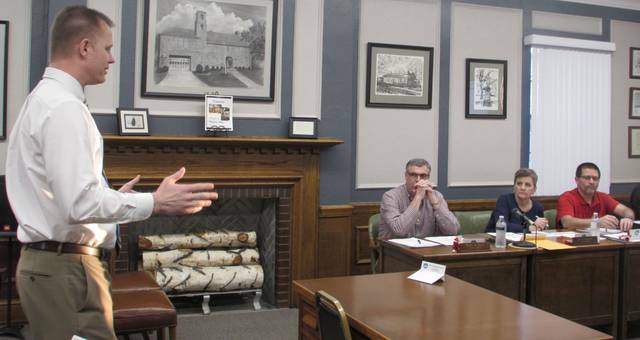 Putnam County Common Pleas Judge Keith Schierloh discusses a grant with Ottawa council members that has been awarded to the county from the Ohio Department of Corrections. It will be used to provide local treatment to lower-level offenders. OTTAWA — Those in Putnam County who have been charged with lower-level felonies will have access to treatment thanks to a grant from the Department of Corrections. Ottawa council heard an update on a grant that will provide inmates with programs. Putnam County Common Pleas Judge Keith Schierloh provided an update on the $75,000 grant the county applied for last April through the Department of Corrections. “The county will make decisions on lower-level felonies that will not be sent to prison and deal with it locally through treatment,” Schierloh said. The county has been notified it received the funds and already received $60,000 of the $75,000 grant. “People are still incarcerated, but if you have a lower-level drug felony, for example, those individuals can be sent to prison, but they will be charged from that grant to house them,” Schierloh said. The grant is a move from the state to help lower the population in prisons. He said the Putnam County jail has a 68- to 75-bed facility that currently houses 38 to 42 individuals. “We have the ability locally to use this grant and do different programs that will make it beneficial,” Schierloh said. The grant will allow for resources to be paid for in an attempt to help fifth-degree felony offenders, such as theft or drugs, locally instead of sending them to prison. “Things on the horizon are the possibility of making level five drug offenses unclassified misdemeanors that would still be with the felony court but would never go to prison. We need to take some advantages of these funds to try to get programs up and off the ground started already,” Schierloh said. It is being looked at passing a drug possession bill that would make any drug possession a misdemeanor offense instead of a felony, Schierloh said. In other business, the council heard a request from Dan Rieman, Ottawa Fire Department chief, to purchase two fire trucks. The trucks will replace trucks that are 32 and 24 1/2 years old. Rieman will make a list of needs the new fire trucks would need to have and get those to the council. Dan Lehman, public works supervisor, requested the city purchase pickup up trucks to replace a Chevrolet S-10 and 2008 truck that have been scheduled for replacement. Ottawa Mayor Dean Meyer requested pricing details be put together for replacing the trucks.